Oxford University is actually a collection of 38 separate colleges which all operate independently and have mini campuses all over the city centre. Some of the colleges date back to the 1500s and quite a few are open to the public. There are two colleges we’d particularly recommend visiting. 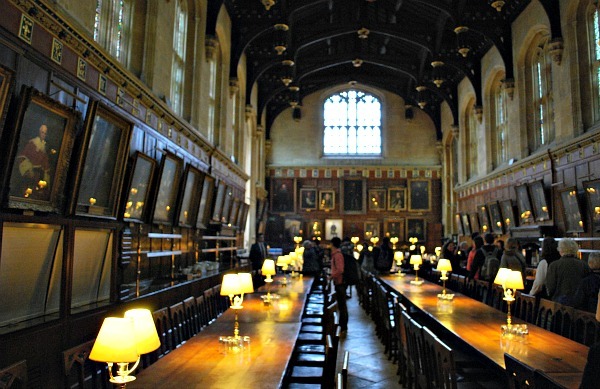 The first is Christ Church which is the largest college, has a dining hall (pictured below) which was the inspiration for the hall at Hogwarts in the Harry Potter movies and its chapel is Oxford Cathedral. 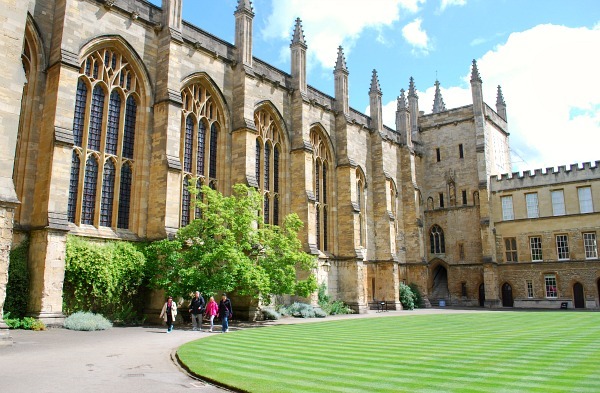 The second is New College which has beautiful gardens containing the old Oxford city wall, a historic chapel, an attractive dining hall and cloisters which were used for a memorable scene in Harry Potter and the Goblet of Fire. If you don’t want to self-tour around the university colleges, you can take a guided tour instead. The Oxford University Walking Tour gets great reviews, lasts around 100 minutes and visits 9 colleges. The busiest college for visitors is Christ Church which is open Monday to Saturday from 10am to 4.15pm and Sundays from 2pm to 4.30pm. It’s also the most expensive at £10 for adults in July and August, falling to £8 the rest of the year (2018 prices). You enter via the beautiful Christ Church meadow which is free to visit during daylight hours and offers a lovely view of the river and Oxford. Follow the signs after you’ve paid you entrance fee and you’ll arrive at a small cloisters area surrounding a water feature. The next location is the stairway to the dining hall mentioned above. It tends to be quite cramped in the hall as there are usually some group visits there too, but you get a sense of the size of the place and what it must be like when the benches are occupied at meal times. Next you get to see the quadrangle which is the largest one at Oxford’s colleges, before a trip inside Oxford Cathedral. The church is lovely and if you don’t want to pay to visit, you can come to a service instead. Finally, you exit via a path which takes you past the rest of the colleges buildings. As mentioned above, if you only have chance to visit one college in Oxford, we’d recommend New College (pictured above). The entrance for summer opening (Easter to October) is on the picturesque New College Lane which starts with the ‘Bridge of Sighs’. Adult admission is £5 (2018 prices) and for us, this college sums up Oxford. Firstly, you’ll be wowed by the quadrangle which is very attractive, but the next stop is the cloisters, complete with an ancient Oak tree, which were used as a Harry Potter movie location when Mad-Eyed Moody turns Malfoy into a ferret. The area is instantly recognisable and we just sat on the benches and relaxed. The chapel is the next stop and there’s plenty to see, before a trip to the dining hall. Lastly you get to wander around the college gardens which are large and are bordered by some of the only bits of remaining Oxford city wall. The college is open 11am to 5pm (Easter to October, via New College Lane gates). The college also opens from October to Easter for a few hours in the afternoon – 2pm to 4pm via Holywell Street gates. 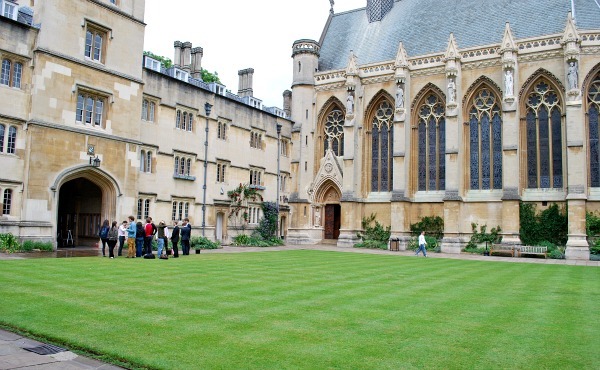 Another college we liked was Exeter College (pictured above), which was part of the University & City Walking Tour. Once again, the layout is similar to the others with a grassed lawn surrounded by a quadrangle including the dining hall and chapel. The dining hall here is like a mini-version of the one at Christ Church and the chapel is very pretty inside with very tall windows based on Saint Chapelle in Paris. This is also the college where Inspector Morse dies in the British TV series after a musical performance in the chapel. If you’re not on the walking tour, the college is open to visitors daily from 2pm to 5pm and admission is free. Most of the Oxford University colleges allow visitors at certain times of the day and many are free or have only a small admission charge. There’s a full list on the Oxford University website linked below. 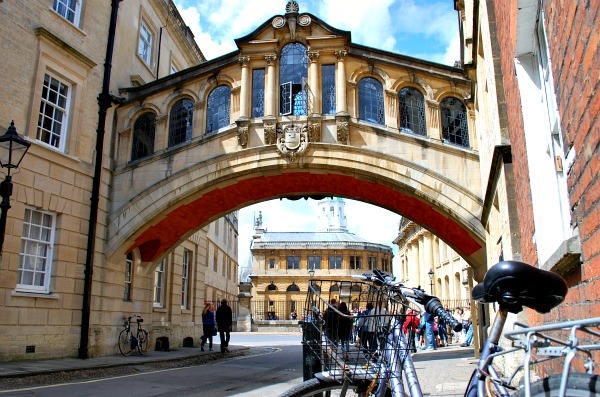 You can also admire many of the collages without going inside, so walk under the ‘Bridge of Sighs’ (pictured at the top of the page) at Hertford College and peep through the metal gates of Trinity College to get a good view of the gardens.